American drivers have spoken and it is clear trucks and SUVs are king in the automotive market for now. Ford has nearly abandoned the car market as it pursues building the more profitable vehicles and Fiat Chrysler and Chevrolet are also shifting much of their production to the bigger vehicles. Chevrolet is also shifting much of its focus to making its Silverado more fuel efficient as it goes forward. The 2019 Chevrolet Silverado 1500 will debut with an all-new, advanced 2.7L turbo-charged 4-cylinder engine as the standard engine on their highest selling models. The 2.7L turbo will replace the 4.3L V-6 as the standard engine on the high-volume Silverado LT and new Silverado RST. The turbo will help it generate 22 percent more torque and give it better fuel efficiency than the current truck. According to Chevrolet, it is also giving the 2019 Silverados other more fuel efficient larger engine options. Over half of the models will be equipped with updated versions of Chevrolet’s 5.3L V-8 and 6.2L V-8 engines that are equipped with new technology that can deactivate as many as four of the engine cylinders to save fuel when the cylinders aren’t needed. Chevrolet is calling its new torque-based powertrain options Dynamic Fuel Management. Chevy is also updating its diesel option. An all-new, Duramax 3.0L inline-six turbo diesel will be available in early 2019. 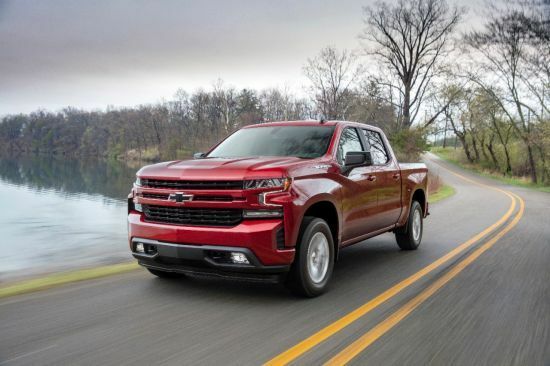 The 2019 Chevrolet Silverado will be larger and a little longer than the current models but amazingly will weigh about 450 pounds less. I would expect that Chevrolet will eventually use its new Dynamic Fuel Management system and the newly designed engines on many of its other popular selling SUV vehicles like the Tahoe. It could also be extended to the GMC vehicles as well as the Cadillac Escalade. Fuel economy numbers for the new engines aren’t out yet but should be released closer to when the vehicles are available. Production on the 2019 Silverados will start later this year, beginning with the V-8 models. With all of the Detroit Three concentrating on building more trucks, fuel economy may become a large factor in the decision making process. Websites like www.Fueleconomy.gov can help potential buyers compare available models, before they buy. Pricing for the 2019 Silverado 1500 has not yet been released.